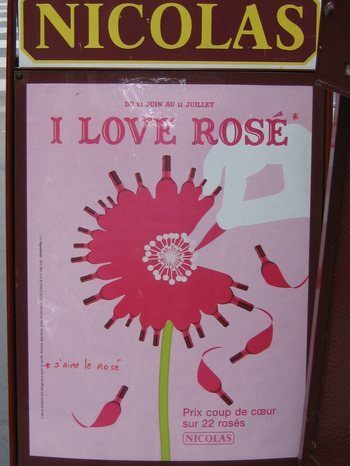 Rosé is very popular in the summer. These are my followers. When we go out walking, I’m the one who really knows my way around, so I lead, and the others follow. 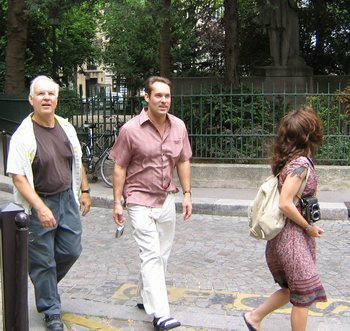 Here we are just beginning a long afternoon of walking on Montmartre. 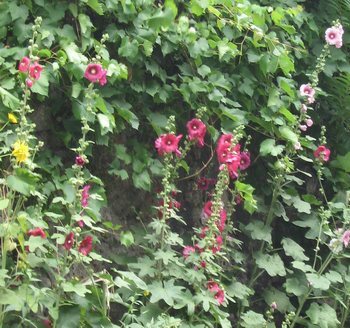 A few days ago, Tom and I went for one of our typical walks, through the 7th arrondissement and into the 6th, to visit the Luxembourg Gardens. It was a beautiful day. We like to stop for a drink at the outdoor café near the Medici fountain in that park. Normally, it is a very pleasant experience, under tall chestnut and sycamore trees. But this time we experienced one of those rare occasions – we had a rude waiter. I write about this because so many people I know say they have had bad experiences with rude waiters and rude shopkeepers in Paris, or in France generally. As a rule, we find rudeness rare here. Yet there is this waiter at the outdoor café in the Luxembourg Gardens. He seems to be of retirement age, and it is too bad he has to be working at this job that he clearly does not like and that he does so poorly. When he approached our table, we smiled and said “Bonjour,” as one is supposed to do. Tom ordered first, asking for a “double café,” an item that is on the menu for 4 euros. Then he screwed up our order. After Tom finished ordering his café and Perrier, I ordered a glass of rosé wine (only 2.50! ), and I did so in French. I must have spoken well enough because he did not dare to ask me to speak English. After a long time, he came out with a tray laden with several tables’ orders. He stopped at our table, put down Tom’s coffee, his Perrier, and somebody else’s espresso. I could see my glass of rosé on his tray, amidst other beverages. As he turned away without placing my glass on the table, I said, very politely but loudly enough for him to hear, in perfect French, “Please, sir. I ordered a glass of rosé wine.” He stopped dead in his tracks. The ladies at the table next to us looked over, mildly amused (he had kept them waiting for a long time before taking their order). He left, only to return a minute later in search of the missing espresso. Tom saw him look toward us, and he pointed down at the espresso. Tom had a sly little smile on his face. But the waiter said nothing. He simply took the little cup and gave it to its rightful owner. When the waiter passed by a bit later, Tom asked for some sweetener (instead of the sugar that came with his coffee). He asked for it in French, and the waiter understood him. But instead of saying something like, “I’m sorry, sir, we don’t have sweetener. Just sugar,” the jerk blurted out, in his terrible English, “NO HAVE. WE NO HAVE.” No apologies, no smile. Only disdain. I wouldn’t care at all about this incident, except it angers me that he is working there and is ruining plenty of American tourists’ afternoons. I think of all the people who only go to Paris for a few days, or a week or two at the most, and people like this jerk just give the wrong impression of French people. Almost all French people are polite. I’d even go so far as to say they are extremely polite. This jerk is a very un-French, unfortunate exception.